this webpage contents: latest | London Musicians Gathering | Repetitive Squeaks - (my internet single) | tribadelica CD | Brian | Cowbell | the only time i lied | tribal voices | Soar | BGG97 | Space Goats spacegoats 13 moons | wildcard | fossil | samples | lostinspace | end links . hope to have broadband nearby soon and update these sounds, things have moved on in the last five years! Sat 24 March 2001: I played a bit of tin whistle with Now Age Radio at the Tribal Voices gig at Glastonbury Assembly Rooms. 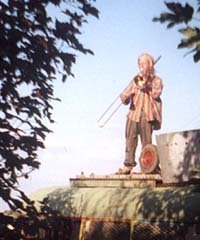 5th March2001: recorded the Farringdon Jam, with me fluting and Angel Tin Whistling. Friday 10 november: all the sounds disappeared due to improvements at phreak , do they work now? all 4 Tribal Voices tapes will be on sale again soon- lets revive this project, and save the planet with music! Monday 09 October: added table of sound samples to end of this webpage. Monday 11th September 2000 recorded a jam at the London Musicians Gathering, Farringdon, here? Wednesday 3rd May recorded two demos with Angel in her kitchen on this laptop, several mistakes in it - after a one minute tuneup I said go for it and we recorded- I had a meeting to get to across london. We hadnt played together for a year - and it shows! 20 april2000 in Glastonbury - jamming with pok and ruthflute 20april2000jam.rm (500kb - 4minutes+3seconds) and 21april2000later.rm (316KB 2minutes+33seconds). Both "recordings" could be for my concept album to put on at the end of parties to get rid of everybody! But they were made using this laptop's inbuilt microphone as a Real Audio file, compressed, only AM radio quality. h00:41wed09feb2000 yesterday yesterday monday evening i went to the London Musicians Gathering upstairs in a pub in Farringdon, (organised by Magi Nicholls). I recorded it with my laptop, real encoder, and yesterday, earlier tonight, I uploaded the sound tracks from mick's - thanks. 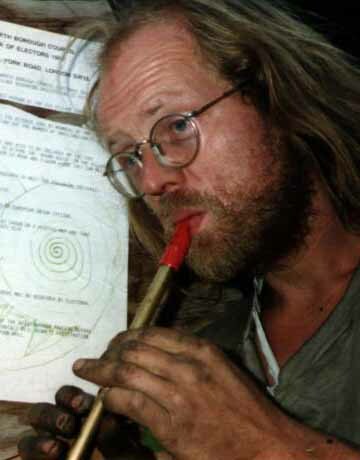 see directory http://www.dicegeorge.com:8080/ramgen/stonehenge/ for more real audio sounds, and a few videos too! 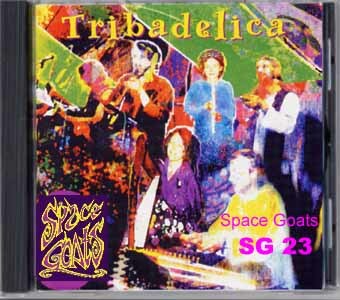 and see Tribal Voices website August 1999: I tin-whistle on Pixies Jinx (track 6) of the Tribadelica Space Goat CD SG23 , for more details see Mandala Records Please someone please record my song The Only Time I Lied (was when I said I didnt love you anymore) (as published in Festival Eye 1999 and get it to number one for Valentines Day and send me the songwriting dosh! 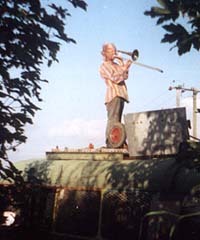 July 1998 - I've bought a trombone, learning to play it at the seaside, an instrument with such potential, such a deep low brassy sound, and analogue, slideable..
though still I prefer my tinwhistles to my flute - or should I say that my lights are my primary muscial instrument? and see the Tribal Voices webpage here at psb tvgeorge.htm with details of how to buy the tapes and CDs, a feedback form, and more..
note: in July 1997 I left London in my bus, having given my two digital master tapes to Dave and Clive who have done nothing with them. But I've offered them them for a possible future TribalVoices compilation tape. In September 1997 at Stonehenge Equinox non-sunrise met Jez. He told me his band were going to record at the Tribal Voices Camp in Devon. I said "I'm in your band aren't I?" and he said "Yes"! So they gave me a lift back to DeadWoman'sBum to get my tinwhistles etcetera, and after a few days delay we went to Devon, hung around for a few days, practiced, ate smoke and drank around the campfire. We recorded two tunes three times: "Stone" and "CCTV" (I prefer the first take. There was three guitars, ExSpaceGoat Ruth on beautiful flute, and me tinwhistling. Someone said that they recorded a hundred and one tracks that week, enough for several tapes, CDs, singles etcetera. Soar: Dice george and the drongos compilation tape benefit for the Stonehenge Campaign. I sold nearly a hundred for three pounds each, I haven't sold one for years, there are a few left, I've lost the accounts. In July 1997 at the Big Green Gathering I jammed with other musicians most nights. Some years ago I recorded me and Belfast Brian onto Ampex quality tape, "Freedom Festival" and"Dice George and the Drongos". I made some C90 cassettes from these and other lower-quality recordings, and sold a hundred or so as a Stonehenge Campaign benefit cassette. I've written two songs - "Wildcard" and "Fossil", but can't/won't/don't sing. Last year, at the Kentish Town Rainbow Centre we record minutes of a solid jam (with a beginning and an ending) on Clive's DCC digital tape recorder with a stereo microphone, but he's in Australia, I want to transfer digitally from DCC to DAT, then adjust the sound levels where a child dropped a cowbell - does anyone out there have the technology (because there were random unknown people involved this would have to be a charity non-commercial publication) - Lord Eric Sugumugu led the drumming.. This November I recorded 4 minutes onto DAT at the NewAgeRadio studios, tin whistle and drums, it could be the next DiceGeorge number one single - called "Repetitive Squeaks"
Because I'm an introvert this is enough for me. It's the world's loss! 13feb2000: I remember years ago at Pilton / Glastonbury Festival on the Monday or Tuesday meeting a guitarist, and me tin whistling, and asking for Hunky Dory, and he knew most of the tracks, we jammed them there for an hour or two- Kooks and Frank Lloyd Right and the Bewley Brothers and and and... it's David Bowie's best album but every other album of his is different (unlike so many bands). Because of this meeting I missed several connections and my window got lost for a week etcetera - but it was worth it. DiceGeorge | Lightshow | Popstar | DiceNews | Published | Stonehenge Campaign | Datelist | WebLinks .